Celiac disease, which can be defined as a gluten allergy, touches 1 percent of all Americans, according to the University of Maryland School of Medicine's Center for Celiac Research. Celiac disease is a serious condition that can increase your risk of autoimmune disease, osteoporosis, infertility and cancers. Eliminating gluten, which is found in grains such as wheat, rye, barley, oats and foods containing these grains, is the only treatment. Rice is free of gluten, but bloating is one of the many symptoms that can indicate that you have been exposed to gluten. If you feel bloated within a few hours after having consumed rice, which is a gluten-free grain, try to remember all the other foods and beverages you had throughout the day and in the previous days. Some celiacs might feel bloated within a few hours of consuming gluten, while it can take up to 1 to 2 days for other people to react. The last meal you had might not necessarily be to blame. Write down everything you ate, and you might realize that some of the foods you had with your rice or at other meals in the last couple of days could have contained gluten and caused your bloating. If rice is the only new food you included in your diet and you believe it is causing your symptom, it could be due to gluten hidden in the ingredients or cross-contamination. Whether you prepared your rice yourself, bought a commercially-prepared rice packet or ate out, gluten could have found its way into your rice. Ingredients such as seasonings, hydrolyzed vegetable protein, flavoring, colorings and food starch could hide gluten. Always read the ingredient lists or ask what ingredients are used when eating out. Choose commercially-prepared rice that is certified gluten-free to be on the safe side or make your own rice using only gluten-free ingredients to prevent bloating and other undesirable side effects of gluten consumption. 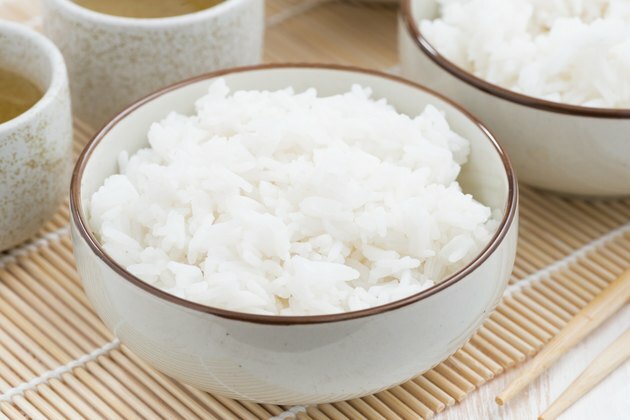 Although your rice might have been made using only with gluten-free ingredients, it can be contaminated with gluten through cross-contamination, which can happen if some ingredients used in your gluten-free rice were prepared with the same cutting board, measuring spoons, or cups or utensils used to prepare other gluten-containing foods. To prevent cross-contamination, prepare your rice separately from other gluten-containing foods at your home, or ask that only clean utensils and kitchen equipment be used if eating out. A few crumbs of bread, even if you can't see them, are enough to trigger health problems in celiacs. If you feel bloated every time you have rice, although you are 100 percent sure that it is completely free of gluten and that cross-contamination did not occur, you could simply have a food sensitivity to rice. To prevent bloating and other uncomfortable symptoms, try getting your rice-free and gluten-free carbs from yams, sweet potatoes, potatoes, quinoa, corn or fresh fruits and vegetables. Consult a registered dietitian for help establish a meal plan that is adequate for your condition.